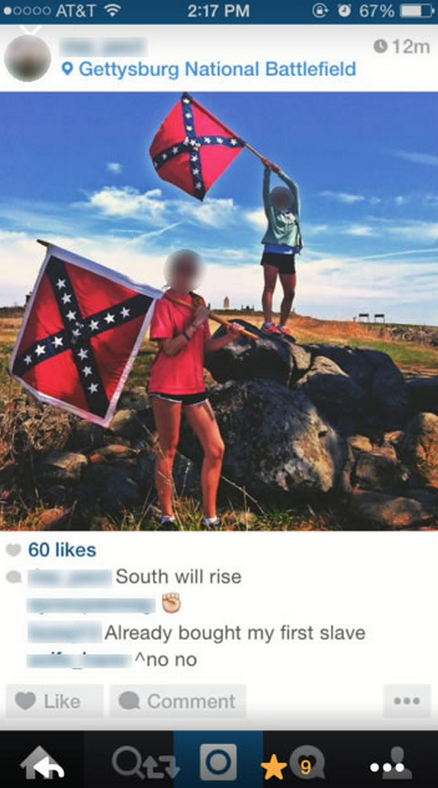 The talk of Raleigh, Durham and Chapel Hill is the Rebel Flag Instagram photo that was shared by an East Chapel Hill student. Below is the Instagram photo posted with the caption “South will rise” at the Gettysburg National Battlefield. When the news in Chapel Hill (WRAL) came on they mentioned that a student shared an inappropriate photo on a popular social media website. I immediately knew that it was going to be on Instagram. Unfortunately, it does not look like anyone has covered this news story on the web. If you know any information about the photo or what has happened to the high school student that uploaded the photo please feel free to comment below. Every weekend somewhere in the U.S., people gather to re-enact the Civil War. Half of the participants at these events represent the Confederacy and the other half represent the Union, with the Confederate actors flying the Confederate flag. I’ve never heard nor read any complaints about these re-enactments. The context of this photo is that the students were on a trip as part of their studies about the Civil War. They were re-enacting the North Carolina’s regiment’s participation in a famous battle known as “Pickett’s Charge.” They posted a photo of this re-enactment. How is this any different from the re-enactments that occur regularly around the U.S. ? The issue should not be with the students who posted the photo, in fact, once the students in the photo realized the impropriety of the comment made by others, you clearly see that they attempted to point out that the comment was not appropriate (the student in the photo is the one that made the “^^no no” comment. 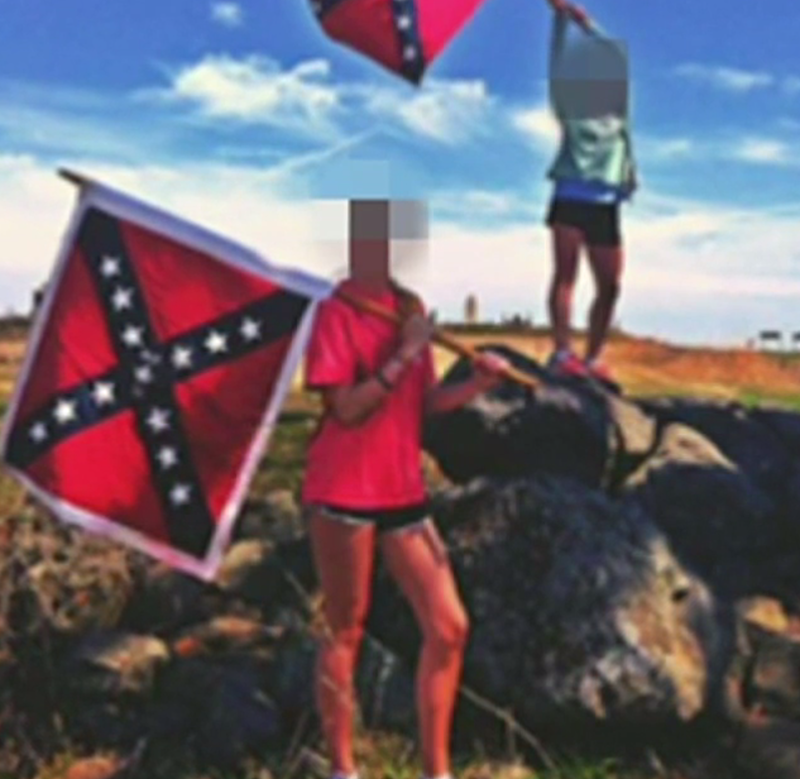 All students involved have made numerous apologies, even though the photo itself was never intended to be perceived as a racist symbol. All that the recent stories have accomplished is to attempt to fan a flame of racism that never existed. It’s time to accept the apology and move forward. Obviously, a lot of time and money would have been necessary to make an opportunity like this available for students. An overnight/out-of-state trip typically requires extensive paperwork and expressed written consent by the local school board. Based on my experience, a teacher in charge of any such trip is not being compensated extra for taking the time and effort, not to mention the obvious risk, in organizing and carrying out such an undertaking. It just seems to me that the adult(s) in charge have been pathetically naïve. How did students qualify to go on this trip? Please don’t tell me that this is an Honors or Advanced Placement class. Just as a military commander must take responsibility for his soldiers and their conduct, so must the adult in charge of this trip take responsibility here. He/she needs to step up and speak clearly and frankly to all that has happened and/or failed to happen. It seems that the students were very poorly prepared in terms of a broad perspective of issues about which they should have been taught. It also appears that the girl’s father showed up uninvited at an event of which he was not expected to be a part. Again, his doing so was incredibly naïve. I live in Chapel Hill/Carrboro. My wife and I pay high taxes so that our two grandchildren can attend the Chapel Hill/Carrboro City Schools, ranked among the highest in the state. But this is by no means the first time that we have had to shake our heads at the obtuseness of school officials here. We can discuss the fact that “She’s only a teenager,” or “People shouldn’t react so emotionally,” etc., but this whole train wreck could have been prevented if the adults in charge had simply done the jobs that we pay our taxes for them to do. My second reaction was, “This is why more teachers don’t go to the trouble to take a group of students across the street, much less out of state, overnight.” Just go ahead and beat me about the head and shoulders with a hoe handle. It’d be less painful in the long run. I’ve been recently thinking the similar factor myself recently. Happy to see a person on the same wavelength! Nice article.